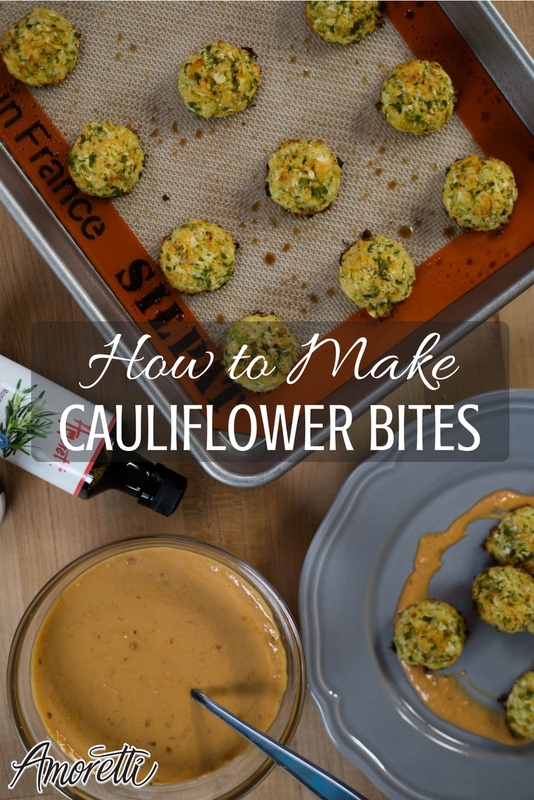 Convert those cauliflower-ambivalent friends of yours with these delicious (and healthy) snacks! ½ tsp Amoretti® Rosemary Oil Extract O.S. ½ tsp Amoretti® Thyme Oil Extract O.S. Coconut oil spray, for coating pan and bites. If the “rice” seems too moist, press paper towels over it to remove some moisture. Spray a parchment-lined sheet pan with coconut oil spray. Using a small ice cream scoop, scoop and place bites onto sprayed parchment. Lightly mist tops with more coconut oil spray. Bake for 12 minutes, rotate pan and bake another 12-13 minutes, until browned on bottom. TO MAKE CAULIFLOWER RICE: Quarter a large cauliflower. Discard core and separate into florets. Using a food processor, chop until florets become very small rice-size pieces.